A Health and Skill Development Centre was today inaugurated at Village Mohna by Sh. Krishan Pal Gurjar, Hon’ble Union Minister of State for Social Justice & Empowerment. The center will provide Medical facilities through a special OPD (out-patient department) serviced by qualified doctors from Doctor on Call (an initiative by Mr. Sunil Sachdeva, co-founder Medanta, the Medicity). The Mohna Health and Skill Development Centre will be the nodal point for all development activities that Dr. O P Bhalla Foundation will undertake. 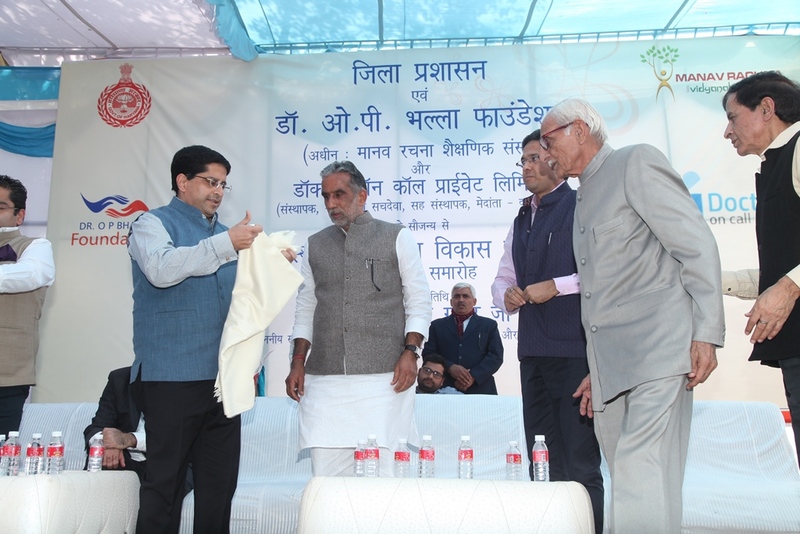 A joint initiative of District Administration, Dr. O P Bhalla Foundation and Doctor on Call; the centre was inaugurated in the presence of senior dignitaries and administrative officials including Mr. Sunil Sachdeva (co- founder Medanta, the Medicity); Dr. Amit Kumar Agarwal ( Deputy Commissioner, Faridabad); Dr. N.C. Wadhwa (VC, MRIU); Dr. Prashant Bhalla (President-MREI); Dr. Amit Bhalla (VP, MREI); Mr. Giri Raj Singh ( Ex Sarpanch, Mohna Village); and Ms. Upma Kumar (BDO, Ballabgarh). Sh. Krishan Pal Gurjar, Hon’ble Union Minister of State for Social Justice & Empowerment said: “Health and education are the roots for a nation’s development. I am very happy to note that the District Administration and Dr. O P Bhalla Foundation have got together to strengthen these basic roots of our nation, in line with the ‘Make in India’ vision of our hon’ble Prime Minister”. 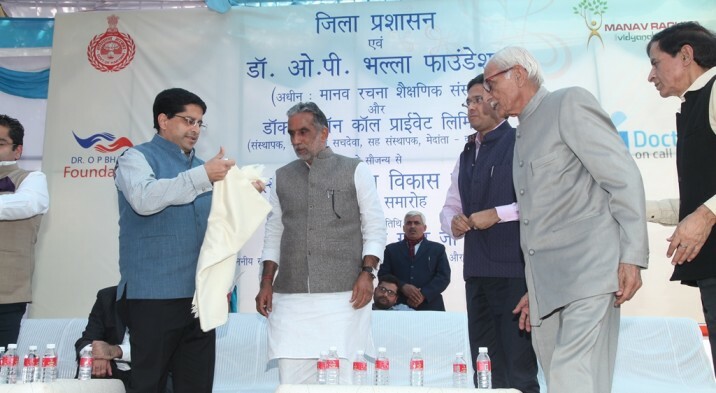 Mr. Sunil Sachdeva shared: “A general physician shall be available to the villagers for basic health problems, proper first aid, diagnosis and prescription of medication etc. The medicines will be made available free of cost to the patients. In the next stage a diagnostic van shall also be available for essential testing and diagnosis in the village itself. This will save the villagers the trouble of going to the city”. Along with the OPD at the Centre, Computer Literacy classes which will be held every Monday & Tuesday (2pm–5 pm) and Employability Skills classes will be held every Thursday & Friday (2pm – 5pm). The courses are of one month duration. “The training areas have specifically been identified based on a survey conducted by the students of Manav Rachna International University. Expert trainers from Manav Rachna Educational Institutions will be at Mohna to train the people. A number of job-related essentials will be woven in to the training, such as Basic English Communication, Soft Skills, Career Guidance, and the use of the internet and computer for everyday work”, informed Dr. Prashant Bhalla, President, Manav Rachna Educational Institutions. Mr. Giri Raj Singh, Ex Sarpanch-Mohna Village thanked the District Administration and Dr O P Bhalla Foundation and promised to wholeheartedly take forward this vision. Dr O P Bhalla Foundation ©2019.